Early planted soybeans are progressing and looking good. Some varieties are drying down and some have already been harvested. These soybeans are progressing at R6 (Full Seed)growth stage now. R6 is defined as the beans inside the pod are touching. We’ve had some questions about stink bugs this week. 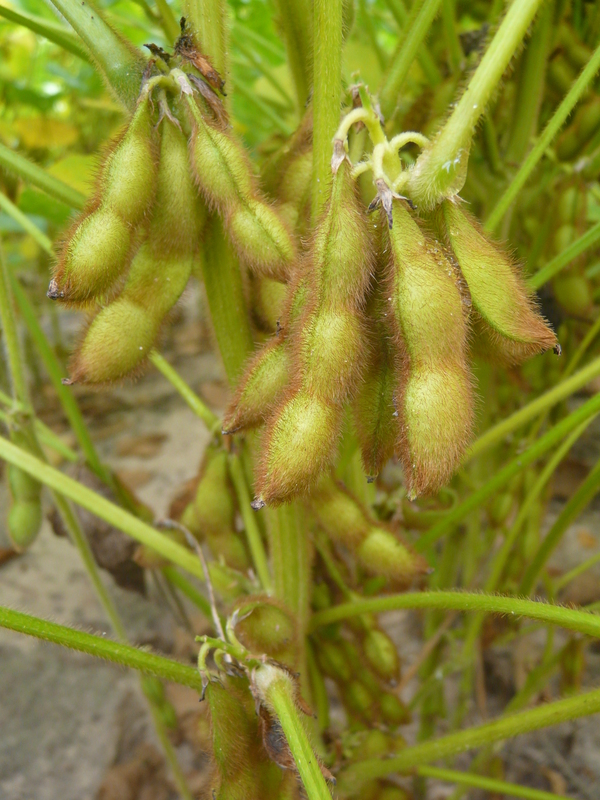 Stink bugs, corn earworms and fall armyworms are recognized as soybean pod feeders. I ran a sweep net through a few fields on a plantation yesterday and the highest number I found was 5 per 25 sweeps, which is below threshold. 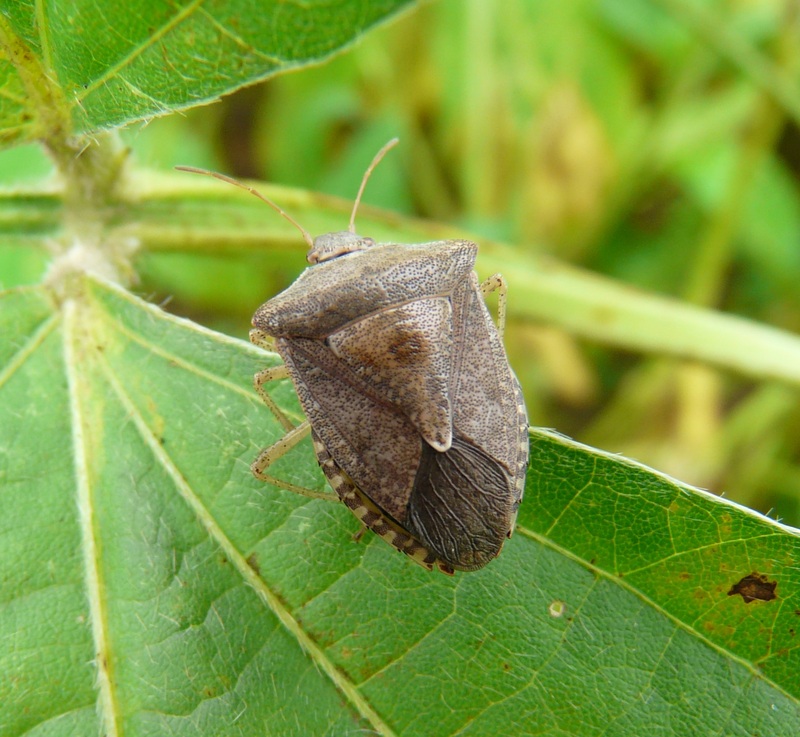 Above is a brown stink bug adult in the field. 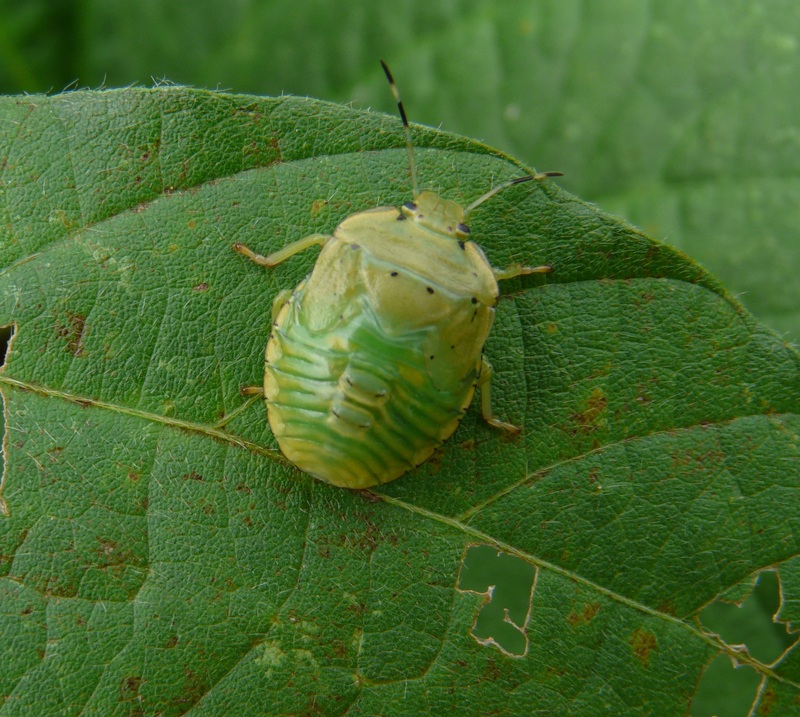 Below is a green stink bug nymph. This is probably one instar from being an adult. Southern Green Stink Bug nymphs usually have pink/reddish markings on them. Bloom to mid pod fill – 0.33 stink bugs per row foot or 3 per 25 sweeps. Mid pod fill to maturity – 1 stink bug per row foot or 6 per 25 sweeps. *beans being grown for seed production, 1 stink bug per 6 row feet will justify control. Should be controlled at any time after bloom when an average of 2 per row foot (1/2 inch or longer) are found. Since the beans are at R6, we still need to treat for pod feeders if thresholds justify. Once we hit R7 (Beginning Maturity), we no longer need to treat for insects. R7 is determined when at least one pod can be found on the plant which is mature or brown/tan in color. Pods and leaves start to “yellow” during this stage. This field is not there yet. 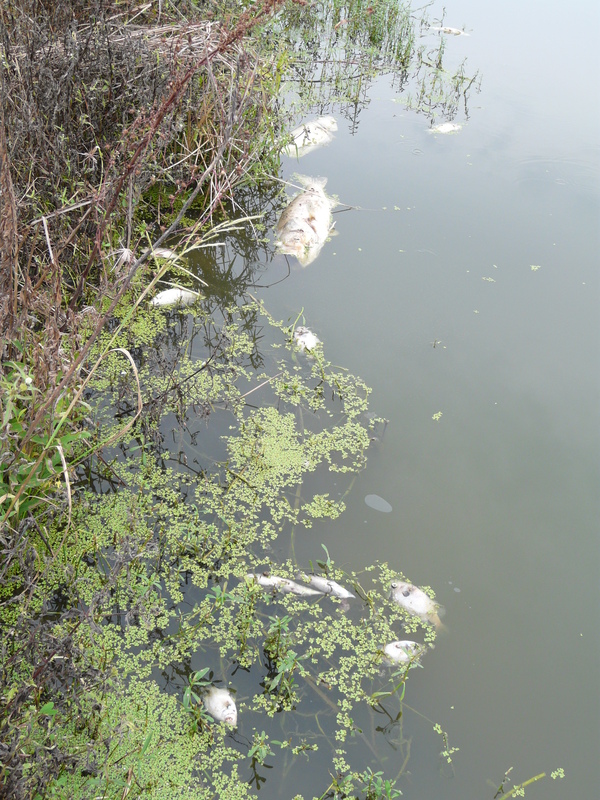 “It looks as though this led to a 60% increase in the cost of scab control alone as you go up from 10 sprays to 16 sprays. In addition to the increased cost of managing pecan scab, black aphid and mite pressure were high in 2014. 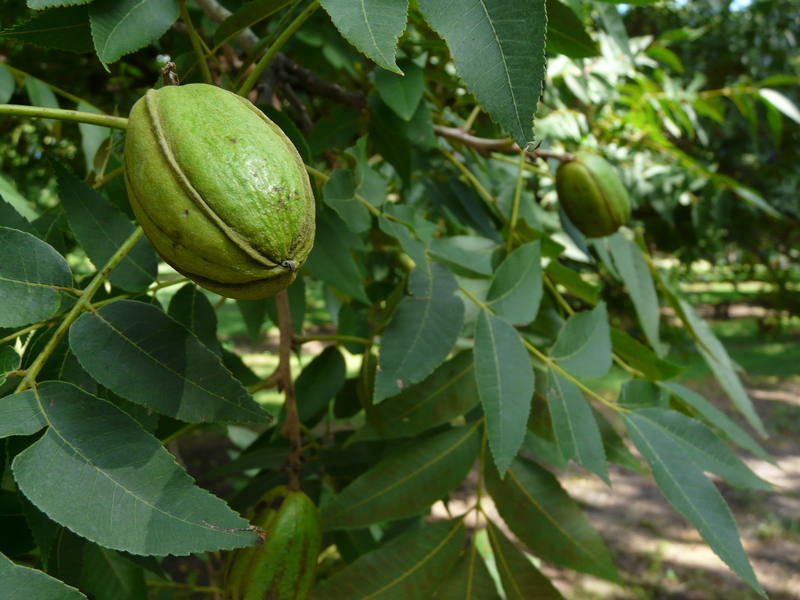 Both of these pests are expensive to control and many growers had to spray multiple times for both pests, which also increased the cost of pecan production. See the graph below for a breakdown of the annual variable cost of production, which totals over $1600/acre with 16 fungicide sprays. An Area Wheat Meeting with Colquitt, Mitchell, and Thomas Counties will be held next Wednesday, Oct 1st. The meeting will be at the Colquitt Co. Ag Center (350 Building 1 Veteran’s Park North Moultrie, GA 31788.) UGA Extension Agronomist Dr. Dewey Lee will be keynote speaker. 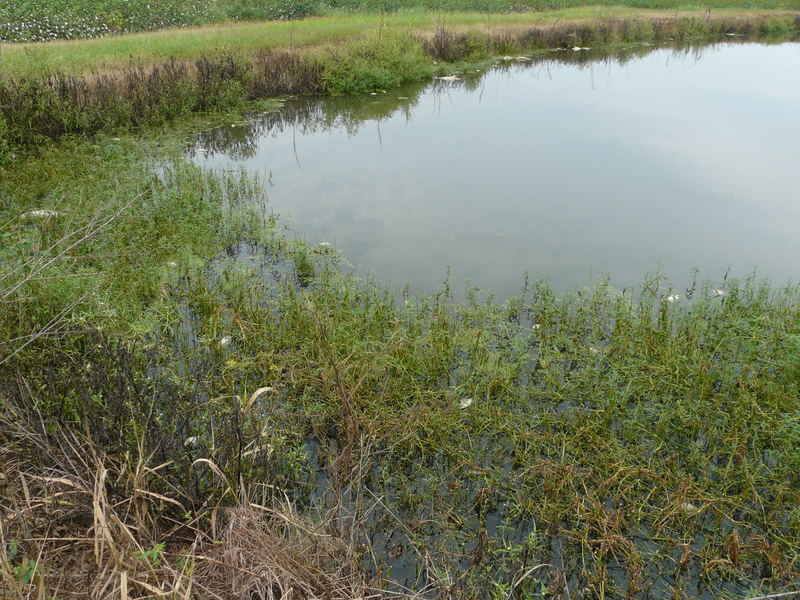 We’ll discuss cultural practices, varieties, weed, and pest management. Please call the Thomas County Extension Office at 229-225-4130 to RSVP by September 29th. We were able to look into some defoliation Friday. 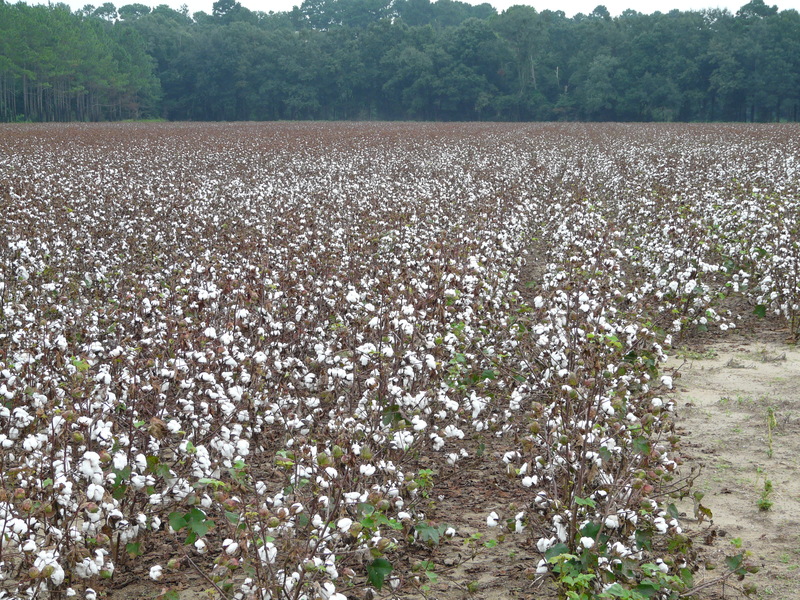 Varieties play more of a role with PGR management whereas environmental conditions play more of a role with defoliation. With the standard 3-way approach (Ethephon, thidiazuron, and tribufos), we do not want to cut our rates is with thidiazuron since regrowth potential is high during this time. There has also been reports of leaves sticking after spray. This is making us drop our desiccant rates in hot temperatures. Not only can too much of an increase in of any product cause leaves to stick, crop oil in the mix can play a roll also. Many are using lower as desiccant rates with hot temperatures. We are in an 8 – 12 oz/acre range of Folex at this time. Chinese demand for pecans at this time seems strong. 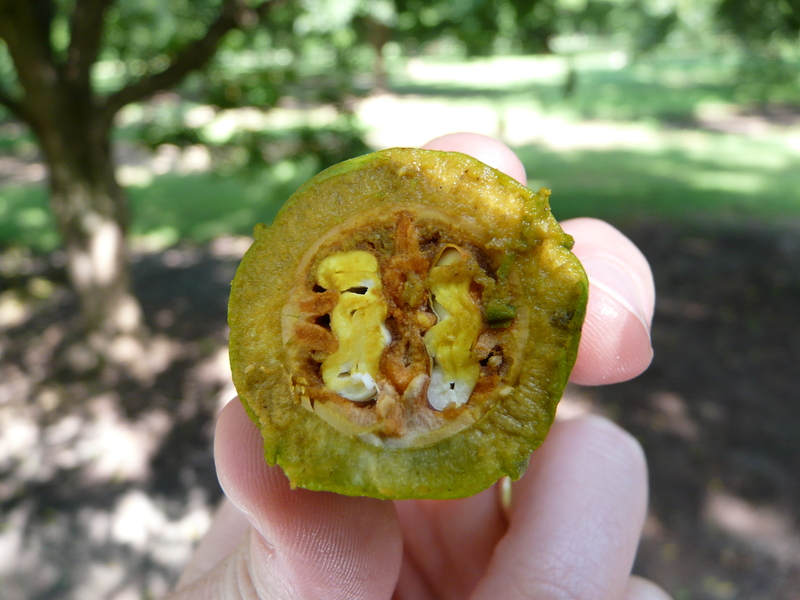 Size will play a large role in export prices offered to growers and our size is highly variable this year, largely as a result of scab pressure early and dry weather during nut sizing. Two weeks ago early contract offers I heard from various growers were at $2.20-$2.35 in-shell for ‘Stuart’ and $2.75 for ‘Desirable’. Over the past week, these prices seem to have gone up to around $2.40-$2.50 for ‘Stuart’ and $2.85-$2.95 for ‘Desirable’. I have heard blends priced in the $2.40-$2.45 range. Again, size will be the determining factor in price. Small nuts will not bring high prices.